The holidays are a time to be merry with those we love, drink, eat and… gain a couple of extra pounds. Thanksgiving is no exception. In fact, according to a study in the New England Journal of Medicine, the average person gains one pound over the holidays and never loses it. No one wants that! Keeping yourself from eating on Thanksgiving is an unhealthy and non effective tactic. If you want to avoid overeating, instead of going into your Thanksgiving meal on an empty stomach, start your day with a well-balanced breakfast. Eating a healthy breakfast jump-starts your metabolism, helps you get nutrients in before a great meal and keeps your hunger satiated, by preventing a sugar crash. Opt for healthy and filling options, such as oatmeal with fruit, eggs and toast or yogurt. If you’re thinking on hitting the road on Thanksgiving, check out our pre-run suggestions. Your Thanksgiving meal doesn’t have to be unhealthy to taste good. Go through your favorite dishes’ recipes and replace all unhealthy ingredients with tasteful and healthy options. Turkey is a great source of lean protein, but when eating it you’ll probably want to skip the skin. Opt for olive oil instead of vegetable oil. For a more nutritious option, consider mashing sweet potatoes – the orange variety – instead of regular potatoes. When it comes to sauces, gravy is the better option. Canned sauces and cranberry sauce are very high in sugar content. If you’d like to indulge in an alcoholic beverage, red wine is the best option since it is full of antioxidants. On Thanksgiving, there is so much to try on the table that it is tempting to have a bit of everything. To enjoy all your favorite seasonal foods you have to prioritize the foods you love the most and don’t normally get the chance to eat. Put on your plate the foods you want most first and if they didn’t satiate your hunger completely, go for more afterwards. After dinner, put the kettle on and make yourself and your guests a cup of tea. This might not be the first after meal drink on your mind, but certain teas like ginger, peppermint, dandelion and green tea are great to aid in digestion. Plus, this is a pleasant way of spending time with your friends and family, after the big Thanksgiving feast. Even though this is not a true eating tip, it is probably the most important one. If you go a little too far on Thanksgiving, do an extra workout later or the next day. And you don’t have to hit the gym to burn calories. Instead, go for a walk with friends and family, or play outside with the kids! 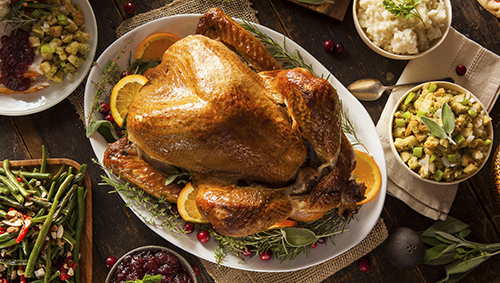 This entry was posted in Nutrition and tagged healthy eating, holidays, thanksgiving. Bookmark the permalink.